Change wheels effortlessly wherever you are. 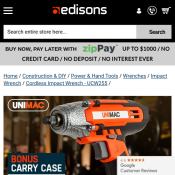 The Unimac 12 Volt Lithium-Ion Cordless Impact Wrench which despite weighing in at just 1.4kg, is a heavy-duty power tool. Great for the home handy-man, this ½ inch square chuck tool packs a high power delivery of up to 300N/m of torque to make loosening or tightening of the toughest, most clingy nuts and bolts a piece of cake. The compact size means you’ll get into those hard to reach places - making it the must-have accessory for 4WD enthusiasts! The UCW255 features a clever centrifugal clutch design which automatically engages when the appropriate speed is reached. The Bonus heavy-duty compact carry case keeps everything protected and organised. And with a 4 metre cigarette connection lead it is ideal for storing in your car.